An app born out of the frustration of not being able to think of an idea for an app has just won four UK students a worldwide technology competition and $50,000. The University students, all aged between 20 and 23, have seen their ‘SoundSYNK’ app heralded one of the best in the world at the Microsoft Imagine Cup World Finals. It is a far cry from the caffeine-fuelled moment of despair that lead to the University of Exeter students’ winning idea back in February. 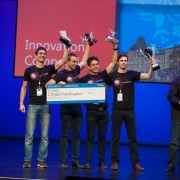 Robert Parker, Edward W Noel, Alexander Bochenski and Jonathan Neumann were so frustrated with not being able to come up with an idea for the regional heats of a 48 hour app-building competition, the Microsoft Imagine Cup that they decided to take a break at 2 am and put on some music. They complained about how it wasn’t loud enough coming from one phone and thought wouldn’t it be great if you could link multiple devices together to play the same song in perfect synchronisation. It was a lightbulb moment and the foursome decided to create it as their app for the competition. It proved such a winner that it not only won the regional heat but also the subsequent UK final. Today, their idea won the worldwide finals of the competition in Russia and now the young student technologists are planning to launch the app, alongside an innovative new way of sharing content later this year under their business, CoLinked. They have been working with Microsoft and Setsquared, a partnership of the universities of Bath, Bristol, Exeter, Southampton and Surrey, to help them get the business off the ground. SETsquared and the University of Exeter’s Student Guild has given the foursome business mentoring through its partners, put them in touch with high profile mentors for one-to-one advice and even flown them to MIT in America to get tips on becoming successful technology entrepreneurs. The training has certainly paid off for the start-up because they have secured a £10,000 business grant from Creative England and an offer of a place within SETsquared’s technology business incubator scheme. Other UK organisations that have supported the youngsters are the Exeter Innovation Centre, Exeter Students’ Guild, Microsoft, the university’s College of Engineering, Mathematics and Physical Sciences, the OpenMIC network and technology companies Opposable Games and Applingua.